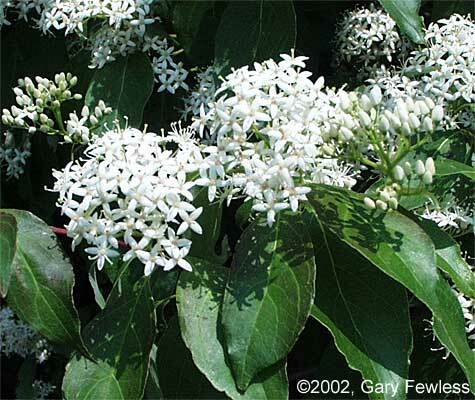 Cornus racemos shrub. ©2002, Gary Fewless. Herbarium Cofin Center for Biodiversity. University of Wisconsin at Greenbay. uwgb.edu (Accessed 1/2018). Cornus racemosa is a shrub or small tree to 5 m tall, extensively colonial from root sprouts (often forming extensive sterile colonies in closed canopy woodlands), habit upright, much branched, newest winter twigs orange-brown, older twigs gray, hairless, slender, young nodes ringed by raised leaf base scars, vein scars 3 (use lens); bark smooth, pith white; winter buds with 2 scales that do not overlap. Leaves opposite, bases of stalks joined across stem as a thin ridge, blade narrowly elliptic, 4-8 cm long, to about 4 cm wide, waxy-pale below, both sides sparsely appressed hairy (use lens), blade narrower than C. amomum. Cornus racemosa flowers. ©2002, Gary Fewless. Herbarium Cofrin Center for Biodiversity. University of Wisconsin at Greenbay. uwgb.edu (Accessed 1/2018). Flowers small, four-parted, white, in round-topped clusters, June-July. Cornus racemosa fruit. en.wikipedia.org (Accessed 9/2014). 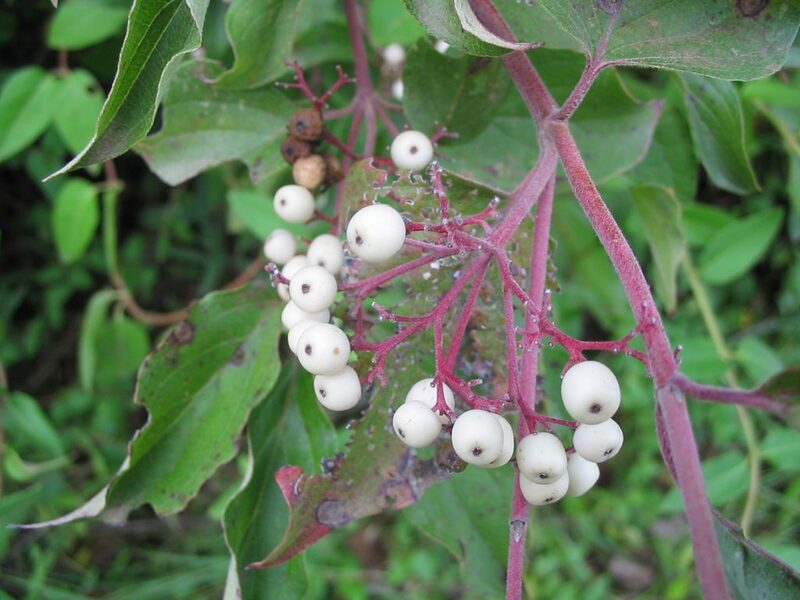 Fruit fleshy, white with red stems, Aug.-Sept. 1-seeded. Seed load 28%. Pulp nutrients: 67%, lipid 33%, protein 4%, CHO 22% (White 1989) Sept. Fruit eaten, and seeds dispersed by birds. Also eaten by raccoons and skunks (Wilson 1993). 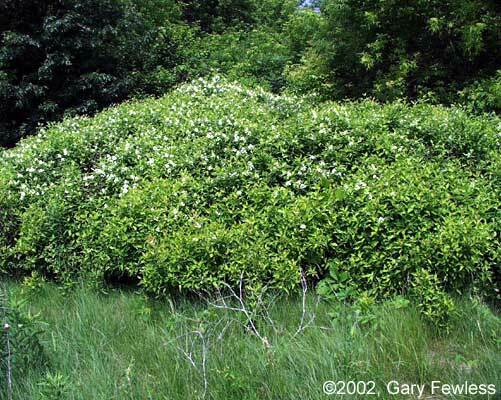 Habitat: Open areas, successional in upland, moist or wet meadows in undisturbed areas (Boeken and Canham, 1995). Moist soil, pH 6-8.5, alkaline fill. Moderately tolerant of flooding; saturated soil for up to 25% of growing season; drought; soil compaction; shade (does not bloom or fruit well in full shade). Intolerant of salt (Hightshoe 1988). Sometimes planted in restorations or as an ornamental. Notes: Leaves and twigs eaten by rabbits and deer (Martin et al. 1951). Inhibits succession to forest by shading out tree seedlings. (Accessed 5/2014).